Arnold Schwarzenegger is set to once again crush his enemies, see them driven before him and to hear the lamentation of their women. 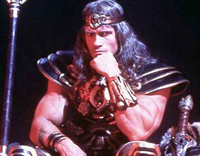 Deadline reports that the actor, who starred in 1982’s Conan the Barbarian and in 1984’s Conan the Destroyer, will reprise his role as the Cimmerian warrior in The Legend of Conan, a new Robert E. Howard adaptation in the works from Universal Pictures. Details are few on the plot of the new film, but it is said to ignore the events of both Conan the Destroyer and of the most recent reboot, 2011’s Conan the Barbarian, which features “Game of Thrones” star Jason Momoa in the lead. Following his time in politics, Schwarzenegger has been lining up projects left and right. He recently starred in The Expendables 2 and will re-team with Sylvester Stallone in next year’s The Tomb. Schwarzenegger can next be seen in The Last Stand, the english language debut of director Kim Jee-Woon, and is currently filming David Ayer’s Ten, an action drama that revealed its first behind-the-scenes photo earlier today.